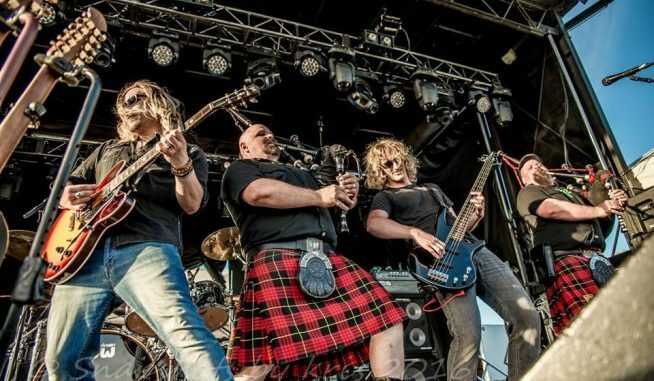 Celtic rockers Mudmen return to Peterborough this month. The band has a long and distinguished career, having met Queen Elizabeth and “King” Gretzky. Their music has been featured in video games, on TV and even as a WWE wrestler theme song. With 9 CD’s and over 2900 shows under the “kilts” founding members Robby & Sandy Campbell are ready to celebrate 20 years. I talked with RC from his home…. Mb: How’s your day? Are you freezing somewhere? Robby: Actually it’s starting to thaw. I’m out here between Port Stanley and St. Thomas and she’s melting today, so it’s not too bad. Mb: That’s crazy. It’s -18 here today. Robby: Oh jeez. I remember playing Peterborough over the years and them saying how it’s a foot under sea level? And that famous little creek that runs behind the old pub we used to play, The Red Dog, she just be flowing in the spring time and they’d say how the drunk people came out of there and never had an instance of falling in there. Nothing bad happened. Peterborough’s got a lot of history in that city, for sure. Mb: Ya, as do you. You’ve played here a number of times. Robby: Ya, we’ve played the hell out of Peterborough over the years. We played with Bif Naked back in the day, at Trent University, and then we played the hell out of the Red Dog. We played with John McDermott back in the day at the Festival of Lights, and we played with a blues band there a couple of times. Peterborough’s been pretty good to us. Mb: You still seem to sell a ticket here! Robby: Peterborough’s got such a great Irish background, and Scottish roots and that. In the old days when we were with the record label, management would push us more towards the college scene, which was great, but you find yourself after two or three years rebuilding, because those college kids would actually quit or graduate and move away and you’d be finding yourself with a smaller fan base, instead of going to the theatres. We wanted to go that route from day one like Great Big Sea and the Irish Rovers did. Play for the crowds that leave with the same woman or guy they came with. They’re not there to drink or fight. When you play a nice hall you get a nice crowd there to hear music. Robby: Ya, and the ones that really loved us back in the day, because we were on the radio and on Much Music… we had that commercial success, lately were finding them stumbling back and they’re not too cool for school anymore. They find their roots or they find grandpa’s music in the attic and they give us a go. We’re rebuilding the Mudmen’s legion of fans again. Next year’s our big 20 year anniversary and we’re writing a book actually. We’ve got Ron MacLean who’s suppose to forward it and quite a few celebrities who are going to say some one-liners for us so, hopefully it will be good. We’ll get our story out there about what we’ve had to endure to keep the ball bouncing and what we did and didn’t do. All the good and the bad. Mb: You have a long list of unique performances and opportunities. How was shaking hands with the Queen? Robby: Ya that was a great moment. There’s a band in the States, I think it’s Blink 82 and they said they couldn’t make their parents proud until they played at the White House and shook Bill Clinton’s hand, and that was kinda the same with our mom and the Queen. That was the beginning of her starting to like the band, that, and we started going more Celtic. We got rid of some of the narrow minded people in the group. We said “We’re meeting Gretzky at the Edmonton Oilers reunion and then we got to meet the Queen…. and we got to meet the king, so we said “We’ve been blessed with a lot of high profile events, so this book is going to be great because a lot of people don’t know the story and what we’ve done.” It’s got more power if you read it in a book. They’ll say “Old Cambbell is on the sauce again telling great stories.” We said, over the years without the promotion, people have no idea that we’re still even rolling sometimes. Mb: Marketing and promotion is everything! Robby: It is, and unfortunately for us people laugh at us and say “Whatever” and I say “Well you know, I think we’re doing pretty good for a two man operation.” My brother and I started the band and we funded everything. We had a record deal and management for 3 years but they left us with unpaid taxes and not in a good financial… any other band would have change the name and started fresh again. We’re actually doing better, being that mid-sized band. Everyone wants to see the big shows and that, but with the big shows come the big expectation to fill the hall. Unfortunately sometimes people go to big shows for the wrong reason. Because they think they need to go. We’re building fans that like the band and want to be there and keep coming back. Sometimes being the big fish in the small pond isn’t the worse thing in the world. Sometimes, playing these smaller halls, even if you only draw 100 people no one can really laugh at you. I’ve seen WWE legends come into events and not draw 100 people and these guys are well polished and had the big push in the 80’s and 90’s selling out Madison Square Gardens, and even so, they struggle sometimes. Sometimes you can make more profit in a small theatre. Sometimes the illusion of the bigger show isn’t the bigger pay day, you know? Mb: Having played 2600 shows over the past 20 years, I’m sure you’ve played every type of venue big and small. Robby: Pretty much. We’ve had numerous booking agents over the years but we book 80-90% of our yearly bookings. A couple of the agents we work with, we should actually cut ties with, but they’re nice people and you never know what they’ll find. Problem is the booking agents like to come in and steal what you’ve built, or they like to phone up and say “How did the Mudmen do at the Market Hall? Well I’ve got this other band…” They like to bounce off your success. We said over the years, you need to get creative. My brother booked this house concert on the last West coast tour and we walked into the place… you know, there’s always those buildings out there, like the Horseshoe Tavern and even Sin City, back in the day in Peterborough… you walk in, in the day, and you’re like “Ok…” but by night there’s some magic to it when it gets dark and people come in. So, we walked into this place and we’re thinking “Ok, they must have an old church or something that they built their house around because they live in the house and they do these house concerts. Nope, we get in there and it’s right in their living room. Like a scene out of CMT where they all get around the fireplace. They put 80 people in their house. We toned ‘er down, We just had it down to the snare drum and the kick and one cymbal, acoustic and obviously not mic-ing the pipes and we made more money in selling merch that night. It was a grand success. So ya, we’ve played all kinds of venues and have been fortunate enough to make it work, though sometimes you pull up and the building is still in flames from the night before! Robby: Ya, and we’re working on some new material. We’ve been talking with some record labels about our 20th anniversary CD and it’s getting to the point where we have to start demo-ing some of the ideas. We can’t miss the boat on a 20th anniversary, that’s a milestone!